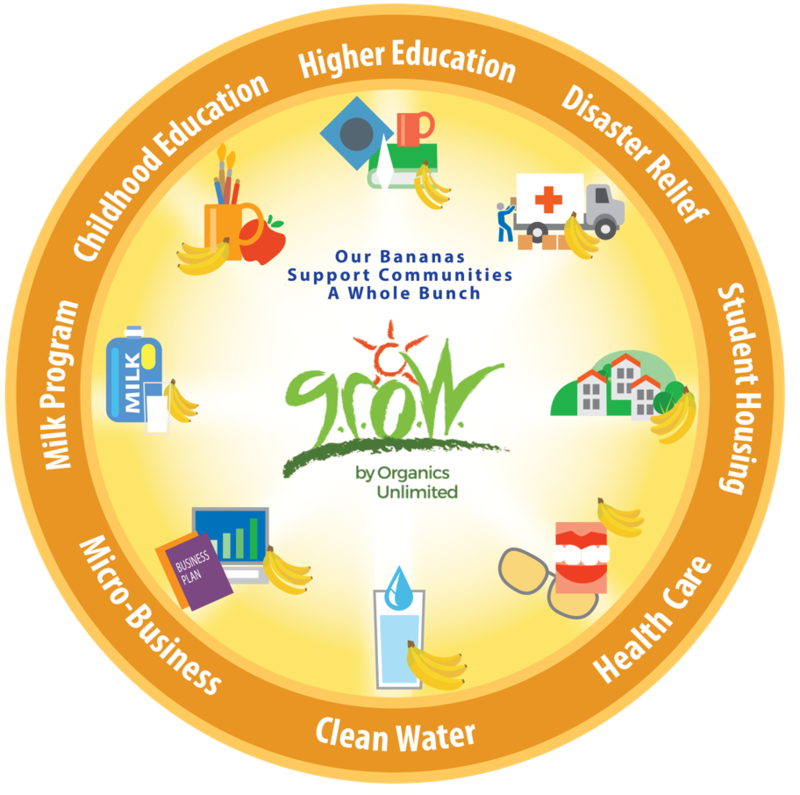 GROW was founded in 2005 by Organics Unlimited in support of its mission: “our responsibility to care for our workers and the communities where we grow our high-quality, organic fruit”. A percentage from the purchase of each box of GROW organic bananas is earmarked for the GROW fund. Since its founding, GROW has raised over $2 million in aid for communities in Mexico and Ecuador through retailer and distributor support. The mission of GROW is to create a better quality of life for not only the farm workers, but entire communities. GROW funds provide educational, dental and vision support, clean drinking water, milk for growing children and other necessities to those who need it the most. GROW is also dedicated to environmental stewardship and promotes farming using organic, sustainable methods, not only for the health of our environment, but for the health of workers and consumers. We’ve been talking about expansion a lot over the last couple years. We received an overwhelmingly positive response from a shopper survey about expansion, created a Strategic Plan built around the idea that we’d expand and increase our impact in the community, and worked with the Board of Directors to design site-selection criteria that met our needs. Since then we’ve been looking for the ideal piece of real estate. The next big step in our progress towards expansion is signing a lease for a location that aligns with the Board-created site selection criteria. Real estate negotiations don’t make the best news. We want to present our plan to the ownership when they are firm and in our best interests. In the meantime, I thought I’d use this opportunity to share some of the preparedness work we have accomplished or are currently working on. The goal of all this work is to give our new expanded store the best chance of success – and it has enhanced our current operation too! Last year we looked at an analysis of our current organizational structure and planned for how it will evolve as we continue to grow and eventually open our new store. Our staff size is expected to grow considerably right out of the gate. Think 60-65 staff members compared to our current staff of 25. We now have a clear path toward what our organizational chart will look like, how roles will change, and where new positions will be needed. This provides staff awareness for those interested in further developing their skills and interests as the Co-op grows. We’ve already implemented a new position, Front End Manager, who oversees the cashiers. We hope you experience continued enhancements in customer service when you check out your groceries. We’ve nearly completed a redrafting of our staff manual complete with legal review. It will prepare us to manage and apply our policies fairly to a larger staff. It will also serve as an improved tool for staff to use in order to understand the relationship between themselves and their employer. The plan for the new store calls for a part time HR person. We know this will improve the workplace because it will provide staff with a regular and accessible expert on the co-op’s benefits, policies, and the handling of sensitive situations in way that aligns with our cooperative values. Last year we voluntarily underwent a financial audit of fiscal years 2014-2015. We had no material weaknesses – meaning from the auditor’s perspective there is no reason to believe that there has been any misstatement of the Co-op’s financial accounting. We are currently completing an audit of 2016. Producing audited statements will give validity to the financial performance of the Co-op as we seek financing for our upcoming project. It also offers us parameters for improving internal controls and ensuring that the Co-op is following Generally Accepted Accounting Principles for grocery retailers. We have focused and will continue to focus on developing the leadership capacity of our management team. This includes trainings, weekly review and practice of leadership tools and educational material, and more. We regular read leadership themed books as a team and meet for discussion. Our latest read was a book called The Good Jobs Strategy. The book that demonstrates that companies that view their workforce as an asset to be maximized rather than a cost to be minimized have both happier workers and better business results. Of course, at the Co-op we want happy engaged workers because that translates to better service to our owners and shoppers. Better service means more folks support our Co-op and our impact on the community grows. We got experience dealing with increased competition after Fred Meyer completed its remodel in 2014. We planned and minimized the impact from the increase in their offering of natural foods. We added fresh meat to the store, expanded our deli offering, and improved our prices. Now we have our eyes set on how a Walmart may impact the co-op. The Management Team will be preparing a plan for how we’ll maintain our momentum after Walmart opens early next year. Preparing for competition or shifts in the market for natural foods is a skill we’ll want even after we open our new location. We know that our willingness and ability to support local producers sets us apart from stores like Wal-Mart and our capacity to sell more local products will only increase in our new store. All this work in combination with the nitty-gritty details of the expansion project (signing a lease) which we hope to soon share means that when it comes time to invest in the Co-op’s preferred shares, you’ll know we’ve done our homework, planned meticulously, and thereby minimized risk to our owner-investors and shoppers who depend on our store for their diets. It doesn’t hurt that it improves the co-op experience now too! We look forward to sharing more of our plans soon!